Summer days are long and full. Working from daylight to dark can make a full day. Potatoes ready to be sold at the Oklahoma Food Co-Op. We are having a real long dry spell. We got a good rain in April, so everything is turning brown. Somehow the corn is going to make a partial crop. Dry weather is good for hay. We mowed hay yesterday and will roll it up today. I am selling calves at the Holdenville sale barn today, but they were shipped yesterday. The Fisher family loads a wagon with sweet corn. 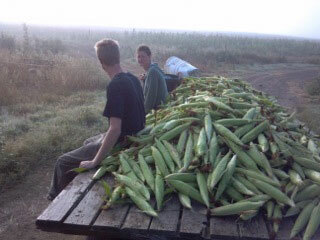 Our morning started with picking a wagon load of corn. Just enough corn for the sales here at our house. 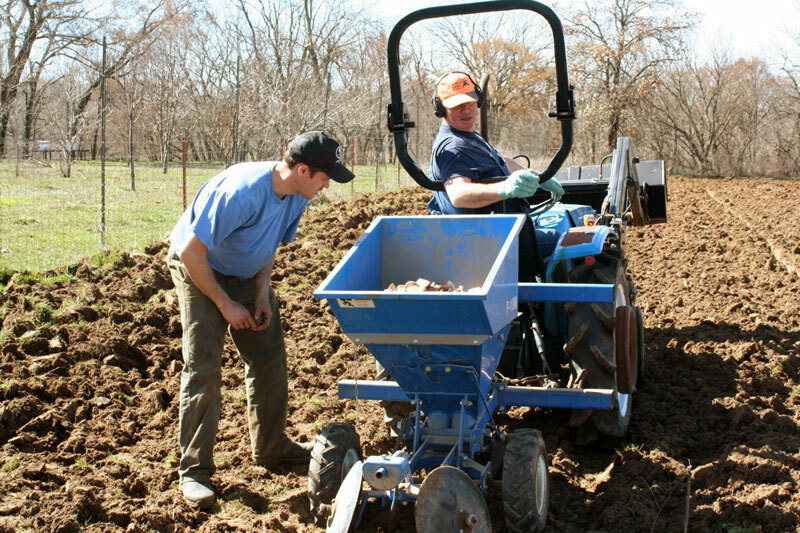 We also dug potatoes to be sold at the Oklahoma Food Coop which is Thursday this week. It makes for a good night’s sleep. The potatoes are coming up! Planting day this year was February 22. Organically grown potatoes are so delicious; you can really taste the difference. They are always popular at the farmers market and with the CSA members. CSA stands for community supported agriculture, a prepaid subscription to vegetables. Every week each member gets a bag of what is available from the garden that week. Some weeks you can choose a few potatoes for your bag. 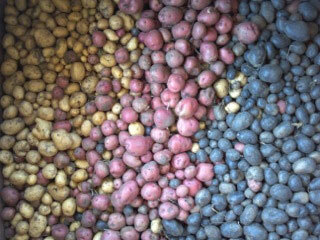 We are growing many different types this year: white, red, pink, purple, gold and fingerling. Just as there are wines that go with certain dishes there are potatoes for every purpose. Whether they get baked, roasted, fried, mashed or put in soup- we grow potatoes to suit each need. 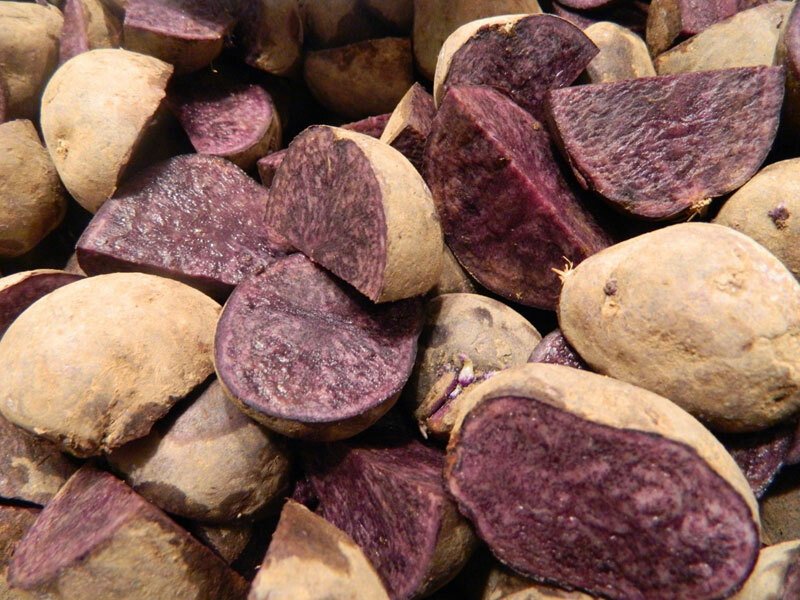 If you enjoy eating blueberries for their heath benefits there is a potato for that too! We have a variety growing called, Purple Majesty, which contains some of the same antioxidants that blueberries have. The next step in the potato patch is to get them weeded and covered with a row cover to keep the bugs away. Commercially grown potatoes that you would buy in the store have been sprayed with systemic insecticide to kill bugs and treated in storage to make them keep all year. No wonder a home-grown potato tastes so good.